Darbi College is authorised by Cambridge International Examinations Board on 26 October 2007 as registered centre BG004. 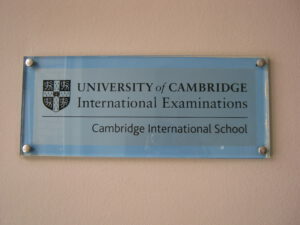 The college is the first Cambridge International School in Bulgaria. The students obtain IGCSE and A Level certificates issued by Cambridge International Examinations Board. In 2008 the college is also registered as a Cambridge Assessment exam centre authorised to administer the Oxbridge admission exams. This makes Darbi College one of the most elite schools in Bulgaria. More than 10000 schools in 160 countries across 6 regions: Americas, Asia Pacific, Europe, the Middle East and North Africa, South Asia, and Southern Africa offer Cambridge programmes and qualifications. There are Cambridge representatives in every region. CIE helps schools to build a Cambridge Advanced curriculum that brings success for learners. The syllabuses prepare learners for university study, which is why universities worldwide value and recognise Cambridge International AS & A Level qualifications. Cambridge Advanced Level is a gold standard international qualification for 16 to 19 year olds.